I always celebrate a little when someone I know has published their first cookbook, and this time it's even a little more special since Shelby Kinnaird was one of the first bloggers I got friendly with when my blog was fairly new. 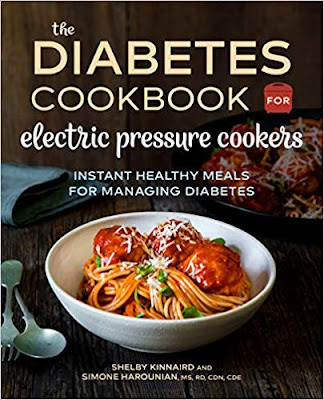 Her book is The Diabetes Cookbook for Electric Pressure Cookers , and I was tickled to get a review copy to peruse. And cook from. Shelby is pretty good at coming up with creative recipes that don't stand up and shout "I'm good for you!" or that seem like they're some kind of special restrictive diet. You'll find plenty of fresh ingredients, and, as she mentioned to me, there's only one recipe with an artificial sweetener, but that can be subbed for regular sugar if you prefer. As I browsed through the book, I decided I was hungry enough to want to make something right away, so I chose the Shakshuka with Swiss Chard. Unfortunately, I didn't have any Swiss chard or anything else that resembled it. But I decided to make it anyway, subbing other friendly vegetables for the chard. I also cut back on the recipe since I was just cooking for me, and eggs aren't exactly stellar when reheated. And then I had to fiddle with the technique a bit, since it calls for setting a pressure cooker for 0 minutes, but mine won't go lower than on minute. My version of the book's shakshuka. So yummy! Still, I think it was a good example of what you'll find in the book. The other recipe I considered making right away was a Mexican zucchini casserole, because I happened to have the right ingredients. There were plenty of other recipes that sounded good, but would have required shopping, and I was too hangry for that. But still, I've got cauliflower on the shopping list to make the Parmesan Cauliflower Mash. That sounds like a perfect side dish, doesn't it? The book has everything from breakfasts to side dishes to main dishes to desserts, so there's something for everyone. Need a great brunch option? 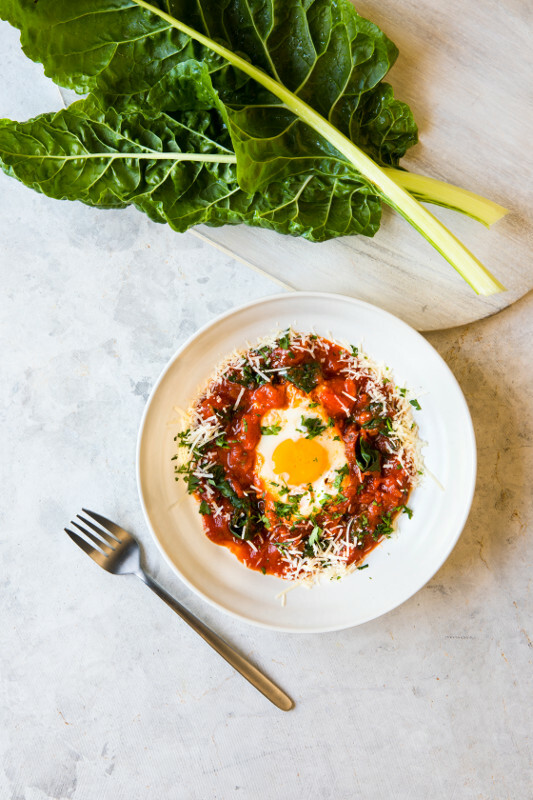 Try shakshuka, a dish where eggs are cooked in a seasoned tomato sauce. This version leans towards the Mediterranean with flavors of basil, oregano, garlic, thyme, rosemary, and marjoram. Your EPC needs to be at low pressure for this recipe. The first time I made it, I use high pressure and my eggs ended up overcooked. Look for a pasta sauce that's low in sugar and sodium (or make your own). Separate the stems from the leaves of the Swiss chard. Finely chop the stem; you'll need about 1/2 cup. Stack the leaves, slice into thin strips, then chop. Set aside. Add the Swiss chard stems, onion, salt, pepper, and Italian seasoning to the pot and saute for 3 to 5 minutes, or until the vegetables begin to soften. Add the Swiss chard leaves and garlic and saute for 2 more minutes. Hit cancel. Add the pasta sauce and let the pot cool for 5 minutes. Close and lock the lid of the pressure cooker. Set the valve to sealing. Select low pressure and set the timer for 0 minutes. When the cooking is complete, hit Cancel and quick release the pressure. Once the pin drops, unlock and remove the lid. Sprinkle with parsley and parmesan, and serve immediately. Substitution tip: If you don't have any Swiss chard, use 1/2 cup bell pepper to replace the stems and 2 cups kale or spinach to replace the leaves. I received a review copy of the book at no cost to me. There's a giveaway on Shelby's Facebook page for the book and more goodies! Good luck! The salad that started the search for ponzu. I usually buy ponzu in a bottle, but recently I needed some to make a salad dressing recipe and even thought I clearly remembered a bottle of ponzu sitting on the lazy susan in the cabinet with similar items, I couldn't find it. It wasn't hiding in the cabinet where oils and vinegars lurk. It wasn't on the lazy susan with unopened sauces. It wasn't in the refrigerator. It wasn't anywhere that an open bottle should be hiding. And it wasn't on my grocery list, which is where it should have been if I actually finished off the last of that opened bottle and threw it away. Then I realized that the book I was using (Japaneasy) had a recipe for home made ponzu. Hmmm. I'd never really thought about making it, but after I saw the recipe, I as stunned at how easy it was. I may never buy ponzu again. Or, to be clear, I may never buy ponzu again after I finish off the two bottles of unopened ponzu that I found a few days after I couldn't find the opened bottle I was sure I had. Combine all ingredients in and stir to dissolve the sugar. Keep in an airtight container in the refrigerator for up to 1 month. As part of the Abrams Dinner Party, I've been getting a ton of cookbooks published by Abrams Books. This time around the book was Cali'flour Kitchen. Cauliflower has gotten trendy these days, thanks in part to the low-carb movement using cauliflower to make pizza crust. I never tried that particular delicacy, but when I got the book Cali'flour Kitchen by Amy Lacey , I figured I'd be making some of that crust. But then ... they also offered some of their pre-made crusts, so I just moved on to using them rather than making them. Easy peasy. 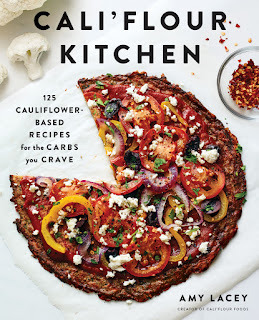 The book isn't ALL about the crusts, though - there are recipes for using cauliflower in all kinds of recipes, including soup, mashed cauliflower, buffalo cauliflower ... there are recipes for making and using cauliflower rice, and for using cauliflower in pretty much every was imaginable ... and some ways that I might not have imagined. So, anyway, the pizza crusts arrived, I had no other plans for dinner, and I browsed the book to see what recipes I could make with what I had on hand. First, I decided to try avocado toast because I happened to have avocado on hand. They had a pretty long list of variations, and like most avocado toast it starts with smearing mashed avocado on the toast. Or in this case, on the cauliflower pizza crust. The caprese version had tomatoes and balsamic vinegar. I didn't have fresh basil, so I left that off. Another version had salsa. I don't know that I'd ever consider combining avocado and cauliflower on a normal day, but I figured I'd give this a try, and it was certainly interesting. To be totally honest, I think I'd prefer regular toast, but then again I don't have issues with wheat flour. 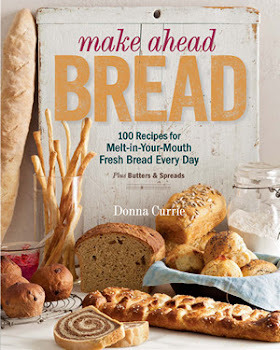 For folks who can't have wheat, these recipes - and the pre-made crusts - are a great option. Next up, I tried the eggs in a basket, which were pretty familiar. Basically, you cut a round hole where you want the egg to nestle, then cook the egg and crust together in a skillet along with some cheese. You almost don't need a recipe for this, considering it's so simply, but since you'd be working with a cauliflower crust rather than bread, it's nice to have the tips for working for the crust. After trying both recipes, I have to say that the eggs in a basket inspired me a bit more, because I happen to like the flavor of cauliflower and cheese together. I think it would be awesome with some roasted red peppers. If you're going low carb or you need to stay away from gluten - and if you like cauliflower a lot, I think you'll enjoy this book. But that's not all. Every recipe indicates whether it's gluten free, grain free, paleo, keto, vegan, vegetarian, or dairy free. Oddly, I'm none of those, but there are still a bunch of recipes that sound pretty interesting. Hello, cauliflower ... nice to eat ya! Yes, I did get the book at crusts at no cost to me.